Hallucinations are one of the more confusing symptoms of dementia seniors may experience. In most cases, a hallucination will be visual, such as seeing people or animals that aren’t there. However, your senior loved one may also have auditory hallucinations or think he or she smells or tastes something that isn’t real. When your loved one hallucinates, you can use these tips to help him or her get through the moment. Some hallucinations may not be a big deal. If your loved one seems happy with what he or she is experiencing, there may be no need to take the moment away. For instance, your loved one may act as though he or she is listening to a beautiful song. If this is the case, let the moment play out. Your loved one’s hallucination will likely end within a few minutes, and you can then return to your activities together. Symptoms such as hallucinations, confusion, and agitation are common in elderly people with dementia. Dementia can be challenging for seniors to manage, but they can maintain a higher quality of life with the help of professional dementia care. Portland seniors can benefit greatly from the Cognitive Therapeutics Method (CTM), an activities-based program designed to promote cognitive health and delay the onset of dementia. CTM is included at no additional charge with any of the in-home care plans provided by Home Care Assistance. Some hallucinations aren’t actually what they seem. In some cases, your loved one may be trying to communicate but the dementia causes him or her to use the wrong word. For example, your loved one may talk about the giant blueberry in the room when he or she is really referring to an oversized floor cushion or ottoman. Take a moment to look around the room to see if your loved one might be trying to say something else. This tactic may be particularly helpful if your loved one seems upset that you don’t understand what he or she is trying to describe. Some hallucinations develop from things seniors with dementia experience in their environment. For instance, your loved one may see shiny spots on the floor and decide they’re water. Alternatively, noises from outside could cause your loved one to think things are happening in the home. If your loved one seems to be triggered by things in a specific place, try moving to a new setting. If you’re in a place where you cannot move, such as a waiting room, try modifying the environment. For example, you could move away from the windows or ask to have a television turned down. 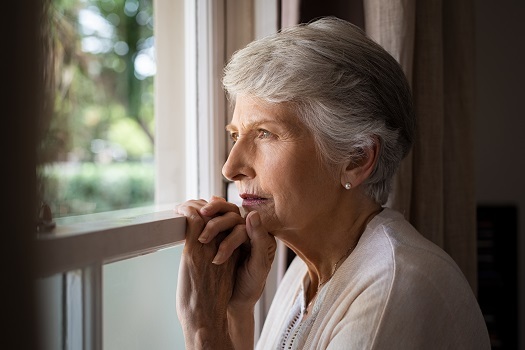 The cognitive challenges that accompany dementia often leave aging adults unable to manage everyday tasks, which puts their safety and health at risk. If your senior loved one has been diagnosed with a serious condition and needs help with tasks like meal prep, transportation, bathing, and grooming, reach out to Home Care Assistance, a leading provider of home care services Portland, ME, families can trust. We also offer comprehensive care for seniors with dementia, Alzheimer’s, and Parkinson’s. Older adults can experience hallucinations that aren’t dementia related. Usually, hallucinations in these cases indicate something is wrong with their health. If your loved one has diabetes, check his or her blood sugar. Seniors with dementia may also be dehydrated or hungry if they’ve forgotten to take care of their needs. Find out when your loved one last ate or drank and offer something. Rehydrating and correcting blood sugar levels might stop hallucinations that have a physical cause. At times, there will be little you can do to stop a hallucination. When this happens, avoid arguing with your loved one or saying the hallucination isn’t real, as this could lead to further confusion. Instead, let your loved one know you’re there and will stay until the moment passes. You can also offer a different activity that might serve as a distraction. Caring for a loved one with dementia is a challenging task for anyone. The responsibilities can sometimes feel overwhelming, but help is available. Seniors can face a variety of age-related challenges. Though some families choose to take on the caregiving duties, there may come a time when they need a trusted Portland elder care provider. Families sometimes need respite from their duties so they can focus on their other responsibilities, and some seniors need around-the-clock assistance that their families are not able to provide. Home Care Assistance is here to help. If your loved one needs assistance with the challenges of aging, reach out to one of our knowledgeable, compassionate Care Managers today at (207) 835-4849.